Oil on board laid on canvas, 18 7/8 x 26 7/8 in. RECORDED: Betty L. Zimmerman, “Paintings of the Eighteenth and Earlier Nineteenth Century,” Cincinnati Art Museum Bulletin 8 (October 1968), p. 6 illus. // “Museum Acquisitions,” The Magazine Antiques 95 (January 1969), p. 158 illus. // “Recent Acquisitions,” Museum News 47 (January 1969), p. 47 // “Accessions of American and Canadian Museums: January–March, 1968,” The Art Quarterly 31 (Autumn 1968), pp. 314, 325 illus. // Gordon Hendricks, Albert Bierstadt: Painter of the American West (New York: Harry N. Abrams, Inc., 1974), p. 343 no. CL-185 illus. // Allan Pringle, “Albert Bierstadt in Canada,” The American Art Journal 17 (Winter 1985), p. 14 fig. 16 illus. // John Clubbe, Cincinnati Observed: Architecture and History (Columbus: Ohio State University Press, 1992), p. 369 // Katharina Bott, Deutsche Künstler in Amerika, 1813–1913 (Weimar: Verlaag und Datenbank für Geisteswissenschaften, 1996), p. 23 // Edward John Hart, The Place of Bows: To 1930 (Banff, Alberta: EJH Literary Enterprises, 1999), p. 191 // Christopher Armstrong and H. V. Nelles, The Painted Valley: Artists Among Alberta’s Bow River, 1845–2000 (Calgary, Alberta: University of Calgary Press, 2007), p. 43 pl. 7 illus. In November 1885, officers of the Canadian Pacific Railway drove a golden spike in Craigellachie, British Columbia, symbolizing the completion of Canada’s first transcontinental railroad, which connected Montréal, Toronto, and the Atlantic Maritime Provinces with Port Moody (now Vancouver), British Columbia and the West. The project was vastly expensive, and the C.P.R. was now concerned with generating enough traffic to repay the massive debt they incurred during construction. The C.P.R. embarked on a massive public relations campaign to encourage passenger rail travel West—for both tourism and emigration. 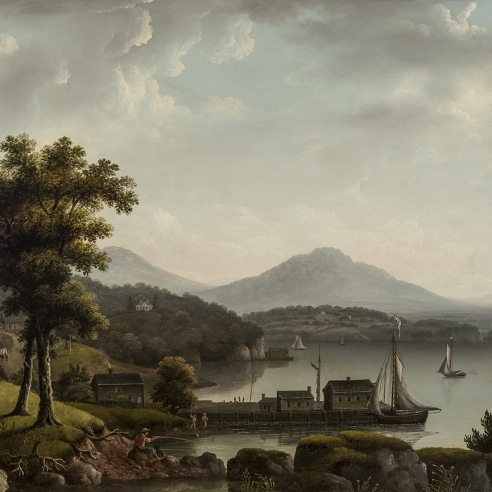 Under the leadership of President William Cornelius Van Horne, who was an avid art collector and a talented amateur artist, the C.P.R. commissioned several Canadian and American artists to paint the grand scenery along the railway line. The first artist to be commissioned was Albert Bierstadt. In the summer of 1889, Bierstadt traveled via the Railway through the Canadian Northwest to make sketches for the commission. The Railway provided him with first-class accommodations in their on-line hotels and hostelries, and free passes for unlimited rail travel. 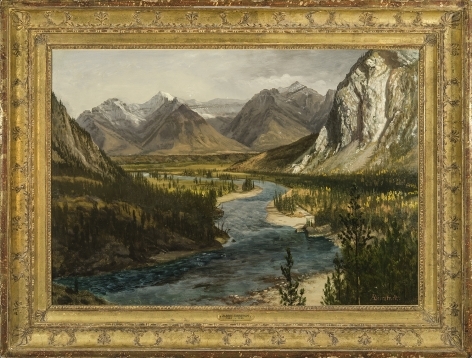 On July 30 Bierstadt left Montreal, and he arrived at Banff, Alberta, on August 5. Banff is a resort town in the Albertan Rockies that was first settled in the 1880s concurrent with the expansion of the transcontinental railway. In 1883 several C.P.R. workers discovered a group of hot springs on the side of Sulphur Mountain, and by 1885 Canada has established a federal land reserve around the springs and began promoting the area as a spa and tourist destination. The town itself was established by the rail station and took its name from Banff, Scotland, the ancestral home of George Stephen, the president of the C.P.R. In 1887, the reserve area was expanded and named “Rocky Mountain Park,” the first national park in Canada. The splendid Banff Springs Hotel, built by the C.P.R. and designed by architect Bruce Price in the Scottish Baronial style, opened in 1888 and operated until 1911, when it was rebuilt. The Hotel remains in operation today. Upon his arrival in Banff, Bierstadt wrote Rosalie that forest fires had filled the air with smoke, obscuring view of the mountain scenery he had hoped to sketch. 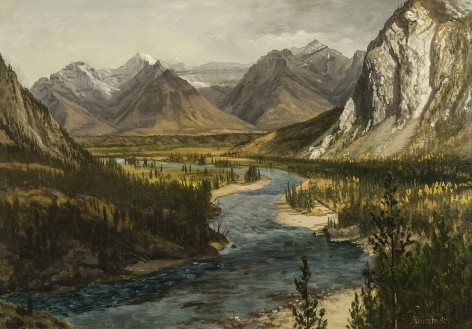 Evidently the smoke cleared enough by his final days in Banff for him to execute a number of sketches that formed the basis for Bow River Falls, Canadian Rockies, the only known canvas by Bierstadt of the scenery around Banff.